It is no news that Apple is trying to make i-phones more bezel and sleeker. With Apple's latest i-phoneX, there is no boundary between you and your phone's data. But in an innovation that would bridge this transition, Apple made the i-phone 8. The i-phone 8 and i-phone 8+ are closely similar in design and operation. The iphone 8 is comes with an impeccable performance ability and great build. One feature I really fancy about the i-phone 8 is the wireless charging that works seamlessly. Even the Early AR apps are very impressive. Though, the design maybe too conventional for some, combined with the fact that it did not come with dual camera. Though it comes with an improved 12MP camera. Powerful camera right? The I-phone 8 is the tiniest of Apple's smartphones to be made recently, though the size did not impair the phone's ability in any way. Just like Nigerians would say; 'Na Machine'. If you are a gamer then this is good news for you because the device comes with an A11 Bionic chip. The iPhone 8 comes with a 4.7-inch IPS LCD screen running at 1,334 x 750, and its screen adhere to the wide, DCI-P3 color gamut. 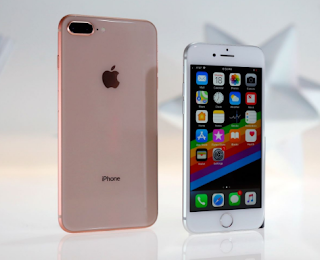 To be sincere, I feel the Apple i-phone 8 and 8+ are a shadow of the i-phone X, but according to CNET, would you have to wait to see the iPhone X before deciding on buying either an iPhone 8 or 8 Plus.